Dr. Bunting's medical service spanned the gap from the horse and buggy days to the modern auto age with its improved facilities for service. Born on 24 May 1864 to father Jacob Danforth and Maria Elizabeth (Krider) Bunting in Wayne County, Michigan, the youngest of five children including John Jacob, Kate Ann, Mary Harriet [Zimmerman], and Charles Danford. His father orignally worked for the railroad in the Detroit area, but later was a storekeeper and eventually appointed postmaster. His mother had the distinction of being the first non-native child born in Wayne County. She died only weeks after his birth on 1 July 1864. 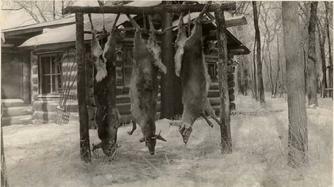 To cope with the exacting service that rough frontier life demanded required a spirit of adventure and the qualities and traditions of the pioneer. 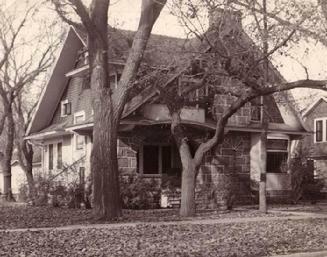 In extremes of weather, savage winters and summer's sweltering heat, the pioneer doctor would start on long journeys across country unmarked by road or fence, to minister to the ill.
Frank and wife Mabel Arlene (Goundry) and son John Goundry (born 14 August 1891) moved to Mandan in 1897 from Attica, Michigan. Their second child, daughter Rhea Krider, was born 27 July 1899 in Bismarck. The couple divorced in 1901 and Mabel took Rhea and returned to Michigan. Son John, then 10 years old, remained in Mandan with his father. Margareta Parkin was the eldest of three daughters and one son born to Walter and Lucy (Whittlesey) Parkin. "Greta" as she was known, was born in Atwater Ohio on 28 July 1878 and came to Mandan with her parents in 1898. She married Frank Bunting on 30 April 1902. Greta frequently accompanied him on trips to remote rural sections and assisted him in tending the ill. She was also his office assistant. Like her husband, Greta was fond of the outdoors and enjoyed hunting and fishing; and was herself reportedly an expert with the rifle. 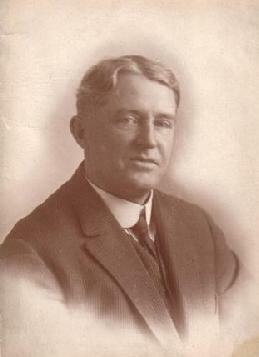 Dr. Bunting serviced as Morton County's Health Officer from 1908 to 1937. Many stories were told by grateful patients of the long trips he made to far corners of the county. On one occasion he started in the early morning hours for the home of a stricken farmer but was forced to enlist the aid of a neighboring farmer enroute to act as a guide on the midnight drive. Arriving at the farm home in the early morning hours, he attended to the needs of his patient and after a brief rest returned to Mandan to resume his duties the next day. 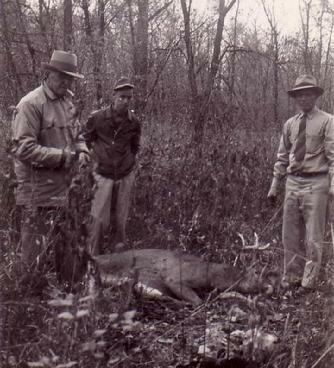 Dr. Bunting found relaxation and pleasure in fishing and hunting. His pungent conversational wit brought cheer and comfort to friends and patients alike. His record of service to the community and his loyalty to his profession are a tribute to the memory of a faithful servant of mankind. Even though he retired in 1940, he continued to care for the needs of many of his former patients at his home. The death of Frank Bunting marked the passing of Mandan's last pioneer doctor -- the group of courageous young men who forsook the more comfortable life of the east to establish themselves in practice in frontier communities in the Northwest. He died on 14 July 1947 and is buried in Union Cemetery, Mandan ND beside his wife Greta.